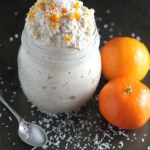 Delicious and healthy, this easy Overnight Oats recipe, with orange, coconut and vanilla, is sure to put a spring in your step in the morning! Mix all the ingredients together in a bowl or jar and place in the fridge overnight or for at least 1 hour. When you are ready to tuck in, remove from the fridge and top the oats with any toppings of your choice. The oats can be eaten cold or warmed in the microwave for 30 – 60 seconds. For a vegan version replace the milk and yogurt with 2 cups of coconut milk. If you like your oats a little sweet add some honey or maple syrup either before refrigerating or when you serve.